14 April 2016. I have always been curious to see Little Bulb Theatre Company, because I have noticed that whenever their name comes up, people who have seen them perform will pause for a moment, put their hand on their heart, close their eyes briefly, take a deep breath and say, ‘Oh, Little Bulb’. So on my way to see their new show this week, I wondered, ‘What sort of theatre prompts this kind of uniform and reverent response?’, and, ‘Will I feel the same way?’ Reader, hand on heart, sigh, I did. 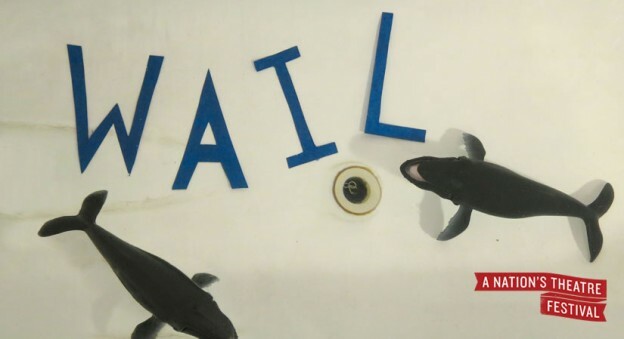 WAIL is described as ‘part-gig, part-lecture, part-your-lips-and-WAIL!’, and it is a gorgeous cabaret piece of devised theatre and original songs framed by the watery questions, ‘Why do whales sing?’ and ‘Why do humans wail?’ At the start, the space is lit with a low, blue light, the stage dark, and whale song is playing faintly, just under the decibel level of audience murmur. The stage holds a motley array of instruments: an upright double-bass sticking out of a low, blue-painted box, two timpani next to a large splash cymbal, a mandolin, two guitars – one electric and one acoustic. Into this musical playground, Little Bulb’s writers/performers/directors Clare Beresford and Dominic Conway bound as the lights come up. They open with a song in aural primary colours with lyrics charmingly composed of facts about whales, jokes falling on the same beats as the rhymes, and the audience is thereby promptly whisked right under their spell. When the song finishes, they begin the first of the witty, intelligent, poetic and riotously funny dialogues in which they explore the large themes: Whale/Song/Why? This is bare theatre, stripped back to essentials, with naked staging and a pervasively, purposely childlike aesthetic, from the plain grey t-shirts and jeans that Beresford and Conway wear, to the varied musical instruments strewn across the stage and the paper cut-out letters spelling ‘WAIL!’ taped against the wooden-panelled back of the stage. One of the interesting effects of this back-to-basics, lo-fi approach to production is that the pure craft of Little Bulb’s theatre shines through like the sun. No extra production is necessary, because Beresford and Conway conjure a rich, entertaining, subversive and comic theatrical tapestry out of the air with just words, performance and songs. This choice of childlike aesthetic chimes in support of one of the finer and more subtle currents running through the show: the evocation of a pure, innocent wonder in the human at the sight of a whale (which also works as a symbol for all of Nature – one of the ways this unpretentious, lovely show opens out to larger ideas). Their sweetly comic series of sketches and songs sweep around the circumference of their questions, exploring angle-by-angle, the Big ‘Why?’ of whale song, and of human song. The show burbles along like ocean foam, light and bright, with a mature sure-handedness of performance from Beresford and Conway. Beresford is an enchanting dynamo of a performer, and a beautiful and accomplished singer. There was a limitless feel in her range of expression, and I thought, ‘she could probably play anything or anybody, any character, colour, feeling or…sea mammal.’ Conway is likewise charming and plays the notes of comedy and poignance in his character with as much sure-fire skill as the ‘hot riffs’ he rocked on his axe. One of the delights of the show, in fact, was how rich the homemade songs and music were, and I kept feeling like it was an ur-musical, with all the pure theatricality and quality of a big show, but with, well, grey t-shirts and paper cut-out props. They involved the audience, who were turned into a whale chorus at one point, and play a game show with us at another point, which ramped up a light-hearted feelings in the room. And there were several moments of enjoyable rebellion, where, having created a tapestry of theatre, Beresford and Conway would comically unravel a few threads in a playful subversion of their created reality. But the show also paused at times, its lightness juxtaposed with depth, to allow moments of contemplation on the sublimity of the ocean, as well as the complex relationship and history between humans and whales. At one point, Beresford sings an old Scottish folksong about the sea, ‘Farewell to Tarwathie’, with a delicate and subtle accompaniment on mandolin from Conway, above a traditional celtic drone, created here electronically: ‘I am bound out for Greenland, and ready to sail/In hopes to find riches/In hunting the whale…The cold land of Greenland is barren and bare/No seedtime or harvest is ever known there/The birds here sing sweetly on mountain and dale/But there isn’t a bird there to sing to the whale’. It was an interesting moment of depth, darkness and quiet that rounded the show. This fascinating theatrical exploration of a large idea, ‘whale/wail’, arrives in the end at a fine moment of coherence in a final song about why we sing, with all the poetry of their beautiful writing tuned to finest form. All the riotous conceits of the sketches, large questions and songs come home at this point, and it is a profound and fulfilling mixture of all the energies they had conjured in the show: ‘A song is a place where you need not pretend/For there’s times when relief isn’t easily found/Then you just sing the same song for round after round/And start it again when it gets to the end’. The rest of the audience loved it as much as I did, and amongst the thunderous applause at the end of the show, there was a spontaneous happening of the whale song they had taught us, a melee of ‘door creaks’, ‘moans’ and ‘woops’ laced into our clapping, which felt like a fitting homage to the brilliance of the show. And I just thought, ‘Oh, Little Bulb’. This entry was posted in Reviews and tagged Battersea Arts Centre, Little Bulb Theatre Company on May 5, 2016 by Joy L. Martin.